Note: During the filming of certain scenes of this picture musical accompaniment was provided to help the players achieve the desired emotions. "The life of the Southern mountaineers, of moonshiners and illicit stills hidden in the hills affords a rich field of romance for photodrama. One of the perfect plays of its kind is In the Name of the Law, scheduled for release by the Mutual Film Corporation. 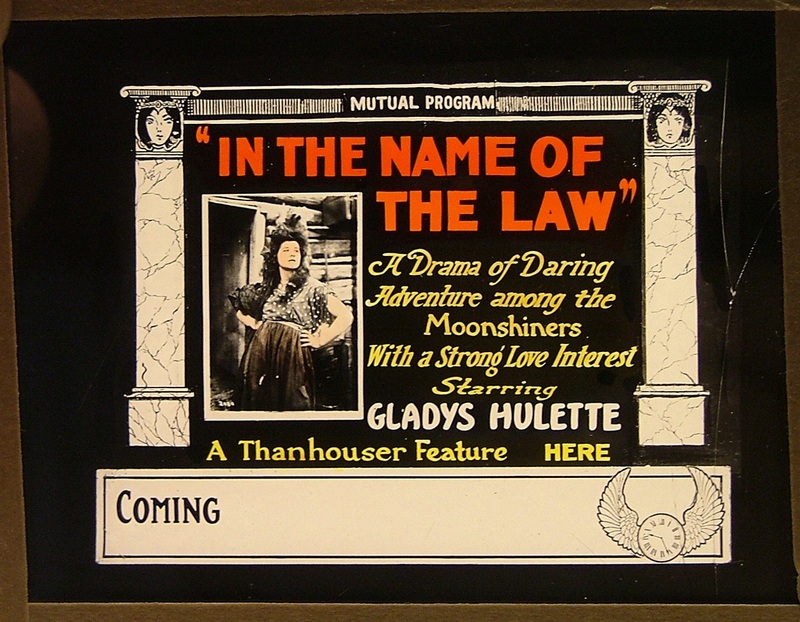 Gladys Hulette, the youthful star, whose intelligence and piquant beauty are strong factors in her rapid rise to fame, plays the part of Daisy Rudyard, the mountain girl, whose love for a young secret service man, Philip Dryden, proves a near-tragedy. The 'Dry Gulch' gang of moonshiners, the story reveals, have so long succeeded in evading the secret service men that at last the star man of the corps is put on the case. Philip Dryden, disguised as an escaped convict, is found, apparently half dead of exposure in the woods, by Jim Rudyard, chief of the moonshiners, who takes the stranger to his home. Soon after Dryden becomes one of the gang. He and Daisy, Rudyard's daughter, fall in love. From the mountain girl the spy of the government learns to appreciate how, to the hill folk, the law represents only oppression. He puts off his duty from day to day. "Meanwhile the jealousy of Tim Leech, an old sweetheart of Daisy's, is roused. He tries to kill the stranger. The first time Philip is saved by Daisy. The second time a slashing knife in the grip of his enemy rips from Dryden's shirt, where he has concealed the silver star of his authority. The bit of metal deflects the knife blade, saving Philip's life - but not before Daisy has seen the badge and realized that her lover is a traitor. While Tim runs for aid, the girl holds Dryden a prisoner at the point of her gun. He tells her that he has lived a lie, but that he has sent no message of betrayal; that love for her has held him back. Daisy lets fall the gun and commands her lover to escape. At this instant Tim, the moonshiners at his heels, bursts into the cabin. As he lifts his gun there is firing from a nearby thicket. Tim falls dead. Then her lover has lied! He had betrayed them to the law. Daisy will not listen to Dryden's denials. But the sheriff of the posse, returning, draws from the pocket of the dead man a letter and hands it to the mountain girl. The note promises Tim Leech the hundred dollars he had asked to inform the authorities against his fellows. The real Judas is revealed - Daisy and Dryden enter upon a new life." "A three-reel offering, by Clinton H. Stagg, featuring Gladys Hulette and Morris Foster. The former is the moonlighter's daughter and the latter a revenue detective. Stories of this type have been frequent, but there are some new tricks in this one which serve to make it interesting. The revenue man first poses as an escaped convict to get into the graces of the mountaineers. Later he destroys the still, has a terrific hand-to-hand struggle with a rival, and finally rounds up the gang, only to release the men because of his love for the girl. As the still no longer exists he is able to do this honorably. The settings and atmosphere are good."